This Delightful Witches Broom has been Handmade by ~Moon Goddess Garden~ using Willow Wood, known for its connection with the Goddes and Luna Magic, for its Handle and Heather brush for its Broom. It has been bound with brown thong and finished with a beaded detail. 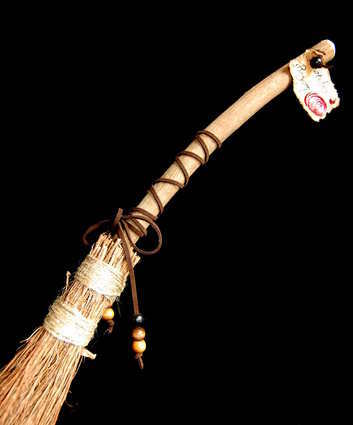 It is ideal for the witch who loves to cast spells on the go or simply doesn't have the room for a full sized broom. It would also make a great Handfasting Gift! Besoms or witches brooms are widely used in wiccan ceremonies and spell crafting. They remove negativity, cleansing the area before a ritual or spell. This Besom could be hung in your Home or Over Doorways to Rid Negativity and Evil. It would make an ideal Gift for the Witch in your Life!.